There is an old saying in the gold and precious metal trading circles that say's "Sell in May and go away". If ever that saying rang true it was this year as we saw gold and silver sell off to two year lows starting back in June. This in turn has made the entire mining stock sector a pretty ugly place to be if your hoping to make a few bucks. Just how bad is it? 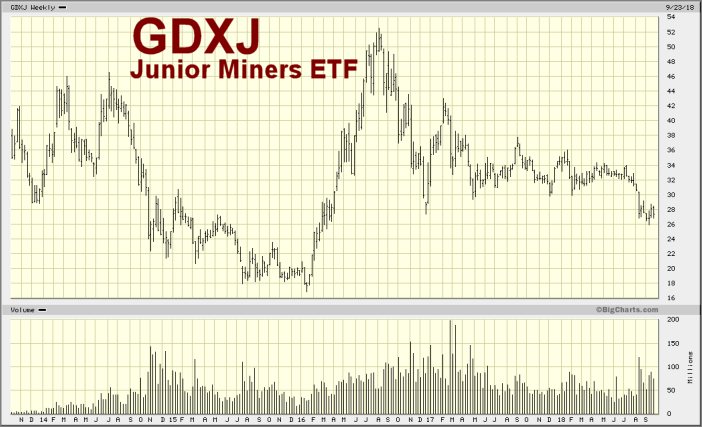 Well in September the GDXJ hit it's lowest point in almost 2 years. There were however a few notable stocks related to good cores and assays that gave investors something to smile about but those were far and few between. 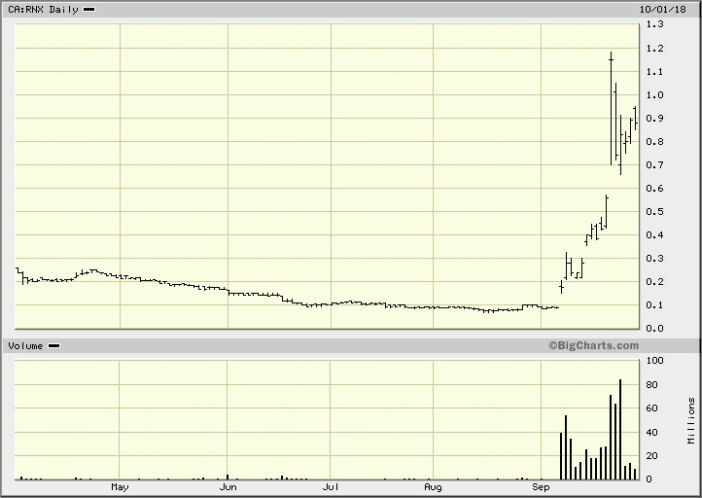 One of the stocks that rallied this summer was Sokomon Iron SIC. Sokomon is working on it's Moosehead property in central Newfoundlandsaw it's stock price rally after the company's first hole, MH-18-01, intersected a mineralized zone that has returned the following summarized assays: from 109.00 m - 120.90 m (11.90 m @ 44.96 g/t Au). Also in Newfoundland, just last week, Great Atlantic GR saw it's stock pop a nice double after the company issued news on a new gold zone at it's Golden Promise property. One of the areas that was seeing a lot of action this summer was in the golden triangle area of British Columbia. After last years big finds from various companies there was a lot of hope for some serious stock action this season but that has not really occured. Of all the main players which include Garibaldi GGI, GT Gold GTT, Metallis MTS and Aben ABN, only one player has seen any upward action in it's stock price and that was Aben. Aben issued news in early August stating that Hole FK18-10, the first of eight holes that have been drilled, had four separate high-grade zones with the best zone returning and interval of 38.7 g/t Au over 10.0 metres including 62.4 g/t Au over 6.0 metres starting at 114 metres downhole. Just this month in the past few weeks Royal Nickel RNX saw it stock become a 10 bagger as it reported that it had doubled the strike length of a high-grade coarse gold structure, to approximately 10 metres, after restarting development in the new high-grade gold discovery area Father's Day vein at its Beta Hunt mine in Australia. This propelled the stock from 8 cents to over a dollar in the matter of a few days. In the Yukon, White Gold WGO saw it's stock price double this in September after releasing news that one hole had intersected 56.25 grams per tonne gold over 3.05 metres from 3.05 m depth, within a broader intercept of 17.34 g/t Au over 10.67 m, which are among the highest grades ever encountered in the White Gold district. Seventy-five meters to the west anotehr drill hole intersected 45.00 g/t Au over 3.05 m from 1.52 m depth, within a broader intercept of 9.65 g/t Au over 15.24 meteres. Wallbridge Mining WM who is working on their Fenelon gold property in Quebec saw it's stock rise nicely this past month on drill results also. Underground drilling produced grades of 137.63 g/t gold over 4.85 metres in the Naga Viper zone, 18.70 g/t gold over 8.00 metres and 39.10 g/t gold over 1.00 metre in the Chipotle zone. Their stock had a 200% pop from 10 cents to 30 cents. Getting back to the golden triangle, there should be lots of news coming out yet from assays as most companies are still drilling. Hopefully the market sees an up turn in metal prices along with good drilling results so that there will be some happier investors this year.